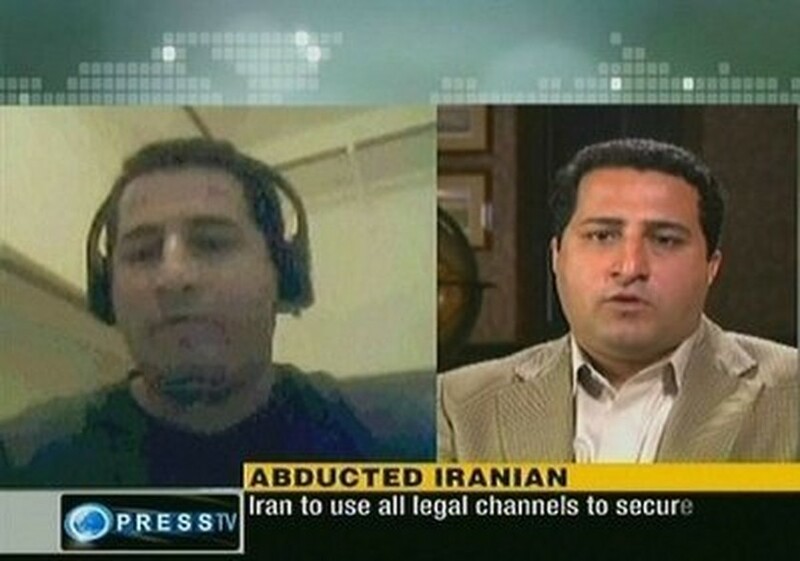 An image grab taken from Iran's state-run English-language Press TV shows Iranian nuclear scientist Shahram Amiri. In a lengthy interview aired by state television late on Saturday, Shahram Amiri claimed that the US agents had acknowledged that the three Americans, detained on the Iran-Iraq border in July last year, were indeed "spies". Challenged by the interviewer about the agents' description of the trio, who have consistently maintained that they were on a hiking holiday, Amiri insisted: "That is the term they used." Washington has repeatedly called on Tehran to release Shane Bauer, 27, Sarah Shourd, 31, and Josh Fattal, 27, insisting that they were holidaymakers who had innocently strayed across an unmarked border. US media have questioned whether the three were even in Iranian territory at the time of their arrest. Iranian officials have raised the possibility of trying the trio for espionage, but no official charges have been announced, and the affair has become an added irritant to already tense US-Iranian relations. Amiri returned to Tehran on Thursday just over a year after he mysteriously disappeared from the Saudi city of Medina while on a pilgrimage. He had resurfaced at the Iranian interests section in the Pakistani embassy in Washington maintaining that he had been kidnapped by US agents and held against his will. Amiri said in the interview that the "spy swap" offer emerged after US agents holding him discovered he had been in touch with Iranian agents while in the United States. "They (US agents) wanted me to say that 'I was an Iranian intelligence agent infiltrating the CIA'", Amiri said. "If I said this, they said I could be part of a spy exchange programme, whereby I could be handed over to Iran in return for the three American spies arrested near the Iraqi border." In previous interviews Amiri has said he was kidnapped at gunpoint by two Farsi speaking agents of the US Central Intelligence Agency in Medina. US officials have repeatedly denied that Amiri was abducted, insisting he was in the United States of his own free will while acknowledging that Washington "had been in contact with him" during his stay. In his latest interview, Amiri said the US agents had "reached wrong conclusions" about his research work which was in the area of health physics in Tehran's Malek Ashtar University of Technology. "They wanted to see if the university was conducting nuclear research. They kept asking irrelevant questions and wanted to link Iran's peaceful nuclear work to that of weaponisation," Amiri said. He said after his "negative" answers, the US agents put him through a lie detector test. "A lie detection machine was attached to me when they thought I was dodging their questions," he said. "In the end they realised that it was worthless intelligence-wise and that their scheme to abduct me had been defeated." He said that he was shown documents "explaining the process of making nuclear weapons which they wanted me to say I had brought to America." Amiri said the US agents were angry when they discovered he had established contacts with Iranian agents "by using codes." "These are issues which I can't talk about as they could hurt national interests," he said without elaborating on how Iranian agents contacted him inside the United States. Amiri said that he was "handed over" to the Iranian interests section in Washington by US agents. "They reached a conclusion that they wanted to close the case and wanted to send me back to Iran," he said. "I did not go to the interests section on my own... it is better to say I did not enter the interests section but was handed over. They ordered a taxi for me and in reality escorted this taxi. They were in a surveillance mode until the end." Amiri also rejected reports in the US media that he had been paid five million dollars to defect.